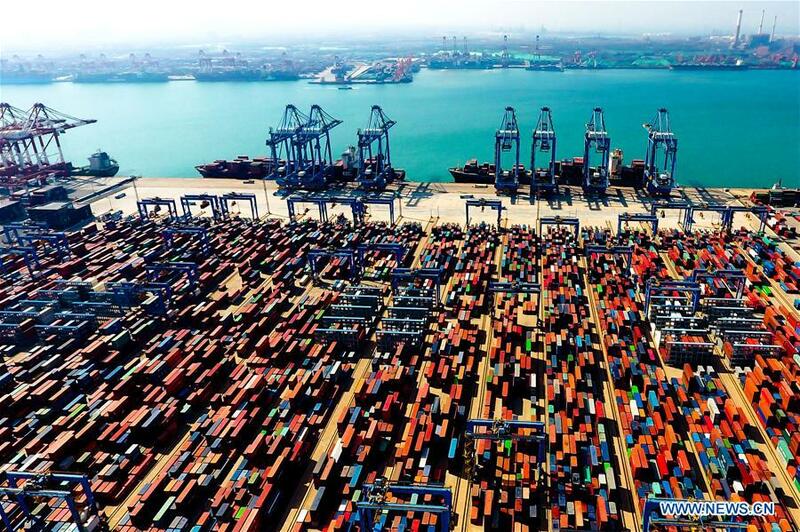 BEIJING, June 28 (Xinhua) -- Seventeen years on, China's entry into the World Trade Organization (WTO) has proven to be a boost to the multilateral trading system and a great benefit to the world. Instead of being a winner-takes-all player, China has reciprocated while benefiting from the WTO entry in 2001, providing huge opportunities for both developed and developing countries. "The allegation that China benefited [from the WTO accession] while others suffered is far from the truth," Vice Minister of Commerce Wang Shouwen said at a press briefing on a white paper titled "China and the World Trade Organization" on Thursday. Calling China's WTO accession a milestone in its integration into economic globalization, the white paper said China has comprehensively fulfilled its commitments to the WTO, substantially opened its market to the world, and delivered mutually beneficial and win-win outcomes on a wider scale. "Through these efforts, China has lived up to its responsibility as a major country," said the white paper. No WTO member has suffered economically due to China's accession, Wang said. He gave the example of growing U.S. exports to China, which surged from 26 billion U.S. dollars in 2001 to nearly 150 billion dollars last year as China became the third biggest market for U.S. exports, up from the 11th in 2001. In 2001, China paid 1.9 billion dollars in royalties to other countries for use of intellectual property. In 2017, the royalties it paid to the United States alone stood at 7.1 billion dollars, Wang told reporters. China's accession also brought benefits to developing countries. Wang said the country has given zero tariff treatment on 97 percent of tariff lines to the least-developed nations that have diplomatic relations with China. "China has become the biggest export market for these least-developed countries, accounting for 20 percent of their total exports," Wang said. China has contributed nearly 30 percent on average per annum to global economic growth since 2002, he said. During the financial crisis, the country's efforts to stabilize the value of the yuan and promote foreign trade further demonstrated its role as a main stabilizer and powerhouse for the world's economy, he said. China firmly observes and upholds the WTO rules, and supports the multilateral trading system, with the WTO at its core. "China had an impeccable record in implementing the WTO rulings," said Wang, noting that the country is "by no means a unilateralist," and does not pressure others with its power. Instead, China always turns to the WTO to solve disputes. By April 2018, China had brought 17 disputes to the WTO, of which eight have been concluded. Meanwhile, it filed complaints in 27 disputes, of which 23 have been concluded, according to the white paper. "None of the complainants has requested for retaliation against China," said Wang, adding that China stands firm in supporting multilateral rules. In recent years, surging tides of anti-globalization, coupled with rising protectionism and unilateralism, have posed severe challenges to the multilateral trading system. "China and the multilateral trading system stand together through thick and thin," said the white paper. China has participated fully in the Doha Round negotiations, having submitted or co-sponsored more than 100 negotiation proposals, it said. "China will continue to fulfill its commitments, comply with rules, actively participate in the improvement of the multilateral trading system, and give firm support to the WTO in playing a greater role in global economic governance," said the white paper. After its accession, China launched major efforts to review and revise relevant laws and regulations, involving 2,300 laws, regulations, and departmental rules at central government level, and 190,000 policies and regulations at sub-central government levels, covering trade, investment, and IPR protection, amongst others, according to the white paper. "To fulfill commitments on trade in goods, the country has substantively reduced import tariffs and significantly lowered non-tariff barriers. By 2010, China had fulfilled all of its tariff reduction commitments, reducing the average tariff level from 15.3 percent in 2001 to 9.8 percent," said Wang. Afterwards, China voluntarily slashed its import tariff rates on an interim basis many times. "In 2015, China's trade-weighted average tariff was reduced to 4.4 percent, fairly close to 2.4 percent of the United States and 3 percent of the European Union," he said. By January 2005, in accordance with its commitments, China had eliminated import quotas, import licenses, specific import tendering requirements, and other non-tariff measures with regard to 424 items such as automobiles, machinery and electronics products, and natural rubber. "China has not only fulfilled its WTO entry commitments, but also pushed itself to go much further in the scope and depth of opening up," said Song Hong, a researcher with the Chinese Academy of Social Sciences. Fulfilling China's WTO commitments has never been the end point of its opening-up. In the face of the overwhelming trend of economic globalization and its winding path, China keeps pace with the times, takes firm steps to expand opening-up, and makes continuous efforts to open up in a more comprehensive, profound and diversified way, with a view to achieving greater mutual benefit and win-win outcomes, said the white paper. In 2014, China issued an official document on furthering trade policy compliance with WTO rules, requiring all levels of government to assess proposed trade policies in accordance with WTO agreements and China's commitments. "We have worked hard to straighten out the relationship between government and the market to give the latter a decisive role in resources allocation and to better tap into the role of the government, continuously improving the socialist market economy system," said Wang. A more open China will provide the world with more investment opportunities, said Niu Li, an economist with the State Information Center. In the next five years, it is forecast that China will import 8 trillion U.S. dollars worth of goods and attract overseas investment of 600 billion dollars, according to Niu. As economic globalization is an irreversible trend, China will neither slow nor stop its opening-up steps, said Liang Yanfen from the Chinese Academy of International Trade and Economic Cooperation.